Formerly 2 houses in row, now town museum. Early C17 or more likely mid C17, but incorporating some C16 work. Close-studded timber-framing, rendering, brickwork, tile roof, brick stacks. A double-jettied front block, staircase hall off to left, paired front rooms, with back room giving an L plan. The off-centre entrance has a stone-flagged passage, probably originally a throughway. 3 storeys, 2-windowed. At second floor are 3-light ovolo-moulded casements with transom under projecting 3-part eaves course to a concealed gutter, and on 3 console brackets. The first floor has full-width range of ovolo-moulded casements with transom, including central canted oriel under moulded bressumer to jetty with end brackets. Ground floor, under moulded bressumer, has replacement 6-light and a low 3-light casement, with a pair of 2-panel doors in plastered cheeks. Windows all with rectangular leading. 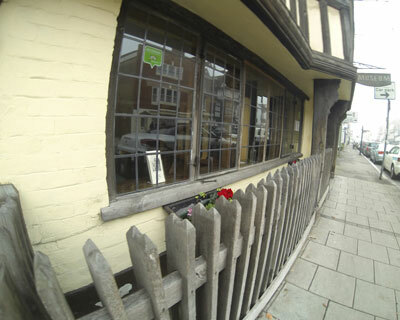 To left of entrance a section of close-set oak railings of C16 or C17, set forward from front wall. Hipped roof, large brick stack to left. Return wall to right in brick, with broad external stack. The back wing, in modified English bond, has a plain brick gable with a large external stack. The front ground floor has been modified, but the back room, beyond the staircase, has a very large rough transverse beam, with added mouldings, and a 5-light casement. The open-well stair with quarter-landings has a solid string, with stick balusters and square newels. It is lit by a 5-light casement. First-floor front, left, has complete C17 panelled walls, wide floorboards, central plastered beam. Above the window is a continuous frieze of C17 chip-carving. The right room is not panelled, and has 2 plastered beams with mouldings to the front only. The small back room, lit by 3+2-light casements, has central moulded plaster beam, and wide floor boards. 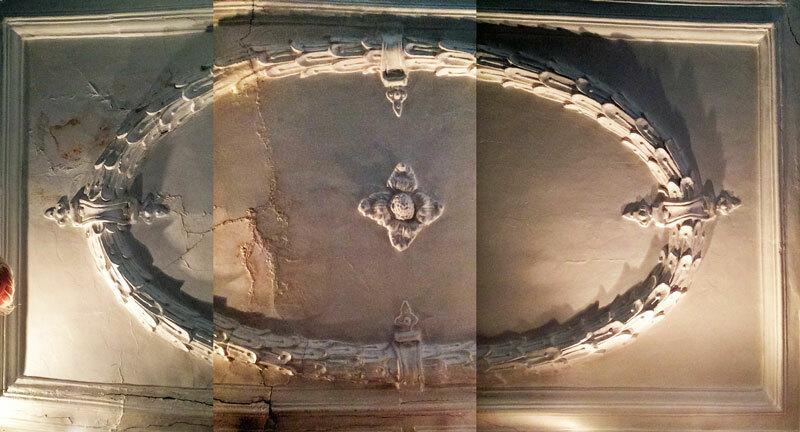 Second floor C17 oval enriched plaster panel. 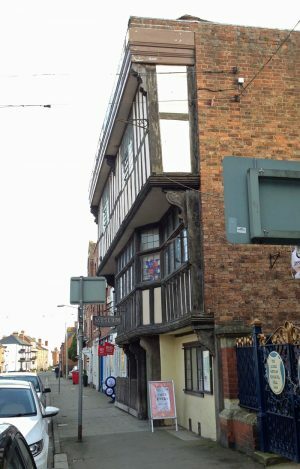 Tewkesbury Museum 2017. Second-floor front left has large late C17 oval enriched plaster panel as central compartment with heavy plastered and moulded beams, at one point carried on a post with console bracket; a modillion cornice in part, and the cornice carries through the rear partition. Pilasters to decorative scroll-like heads and panelled plinths flank the window. Room to right has 2 heavy sagging plastered beams, but is otherwise plain. At the stair-head, leading to the back room, a C17 six-panel door in very thin members. The hipped front block with deep eaves and window strips is similar to No.100 Church Street (qv) as in exhibiting application of broadly Renaissance forms to a traditional timber-frame structure. This property is also notable for representing a departure from the traditional (for town houses up to the mid C17) side-entry plan, in having a central passageway between 2 heated rooms and a staircase (since replaced) in the back wing. (Victoria County History: Gloucestershire: London: 1968-: 131-2).